When in the midst of mass social transformation, it is often hard to see progress until you have the benefit of looking back after success has been achieved. One way we measure success is by recognizing the growing popular movements across multiple fronts of struggle. Another way is by observing the actions of our opponents. In our sixth class on How Social Transformation Occurs, we examine the obstacles that movements confront in achieving social change. One of the tasks of the movement in this stage is to achieve national consensus and overcome the obstacles of the power holders. 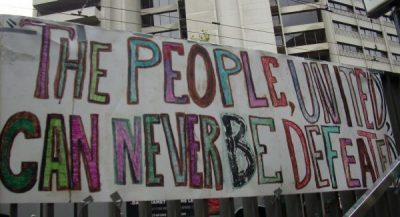 New resistance movements have emerged since the Occupy Movement rose up in 2011, including the Fight for 15, Black Lives Matter and Idle No More, to name a few examples of many. Popular Resistance grew out of the Occupy Movement as a vehicle to report on, monitor and help grow the resistance movement. Clinton lost the presidency because she was an establishment candidate running in an anti-establishment electoral year. The Clinton Foundation was a foundation funded by millionaires and billionaires as well as big business and trans-national corporations. She epitomizes what people are organizing against, yet now she calls herself a leader of the resistance. It is sadly amusing but ironically makes the point that the resistance is winning. We have grown since 2011 to the point that establishment-elites want to claim to be part of the resistance. Our job is to let those who joined groups like Indivisible and Onward Together know there is a genuine resistance that Democrats are emulating, which stands for true transformation and rejects the policies of Hillary Clinton and the economic and political elites she and both Wall Street parties represent. On multiple issues, those in the power structure of elected officials and their think tanks are stealing the language of the movement. One example is the campaign for National Improved Medicare for All (NIMA). We use that specific language because every word describing it matters. Those who want to protect the status quo use the word “Medicare” to describe fake solutions that do not achieve the real goal. The Center for American Progress, the top Democratic Party think tank that is funded in part by the insurance industry and healthcare profiteers, has put forward “Medicare Extra for All.” This is not NIMA but a public option using the popular word Medicare to fool people. Another fake Democratic plan is a “Medicare Buy-In” or plans that would lower the age for Medicare. These are all false solutions. Democrats are pushing NIMA-sounding like approaches because 85% of Democratic party voters support a national single-payer system based on improved Medicare. Republicans and businesses are also moving in this direction. If the movement does its job well, by the early 2020s there will be a national consensus across political affiliations and ideologies in support of the solution to the US healthcare crisis, National Improved Medicare for All. Learn more about this at HealthOverProfit.org. Healthcare is one example. This week, the people of Missouri rejected another false policy put forward by big business in a disguise called “Right to Work.” By a landslide vote, the people of Missouri rejected a right to work voter initiative, which would have eroded worker’s rights to collective bargaining. 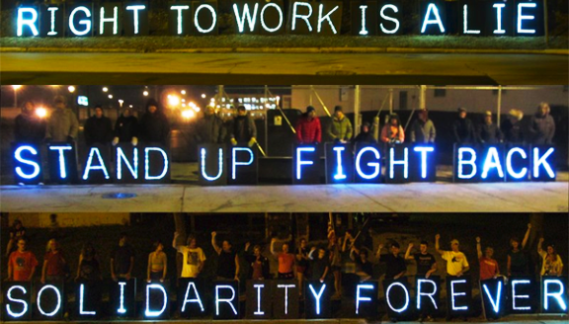 This vote comes at a time when the nation needs a national renaissance of worker power. It is time for unions to remake themselves after 80 years of decline. Unions need to become democratic in structure rather than hierarchical. Unions need to do two things to recover from decades of setbacks(1) break from the Democratic Party and build independent political power, and (2) they need to represent all workers and communities, not just members of their union. The recent teacher’s strikes which occurred in multiple statesshowed teachers going beyond the limits set by unions. UPS, where workers voted 92% for what would be the largest strike in US history, is in the throes of debating a new contract, which Teamsters for a Democratic Union believes sells out UPS workers. Another example is the constant killings of black and brown people by police across the country. National consensus is developing against this brutality thanks to Black Lives Matter and others, as can be the ‘take a knee‘ protests in the NFL. Despite pressure from President Trump and team owners, players are continuing to take action against racist policing by patriotically taking a knee during the singing of the national anthem. Police violence against black and brown people is a long-term problem, going back decades. In the era of Bill Clinton, the phony solution of community policing was put forward. It is phony because it failed to give power to the community to reject police who have demonstrated racism and violence. What is needed is community-control of police and community-based solutions to crime and violence. When the people are in control, then the police will do what they should be doing, and some claim to be doing (and some officers actually try to do in a system that does not work) — serve the community. The most powerful tactic of the opposition is to divide the movement. The corporate-CIA group, Stratfor, most clearly described this strategy. They divide activists into four types of people: “radicals, idealists, realists, and opportunists.” Their strategy to defeat social movements is to isolate the radicals, offer the opportunists money and access to elected officials, convince the realists to compromise on a non-solution and push idealists to see their ideal cannot be achieved and accept something that looks like a step toward the ideal. The key group is the radicals, who focus on the root of the problem, push necessary transformational solutions and refuse to compromise. Movements need to make a place for radicals and listen to their views so as not to be taken off track. The problem is that the current system does not work for people but is designed to work for the economic elites. There may be good people in the system, trying to do the right thing, but they cannot overcome the system by working from the inside. The movement must work to pull people from inside the system into the movement. A police officer’s family needs National Improve Medicare for All. A black police officer’s son will face racism from police officials just like any other black youth. Youth face outrageous tuition, school debt and wages too low to live on. Business owners know their employees would benefit from health care for all and that they can’t compete with businesses in nations that have national healthcare programs. People in the media see the misleading reporting they are required to produce to advance in their careers and know this is not why they wanted to become a journalist. There are people in every segment of the power structure that see the problems and want to help put in place solutions. Drawing people to the movement is one of the tactics in building national consensus and a movement that represents all the people while weakening the power structure. We need to develop strategies to keep movements unified, bring people into the movement and connect our different fronts of struggle to build a movement of movements. We have written about how the next decade provides an opportunity for tremendous social transformation that puts in place progressive policies to meet the necessities of the people and protection of the planet. The people in power also see that change is coming, movements are growing and the status quo is unable to deal with multiple crisis situations that cannot be ignored. Transformation is on the horizon if we remain clear in our vision for economic, racial and environmental justice, pull people to the movement from the power structure and undermine the tactics of those trying to co-opt, mislead and divide. Together, we can create transformational change. We are closer than we realize. Kevin Zeese and Margaret Flowers, co-directors of Popular Resistance where this article was originally published.